Here's Ben crossing Market St. At 6th St in Center City Philadelphia! Yesterday was a busy day at Another Delco Guy. We did some shopping so The Bunny had less to do, dyed our eggs, hit Chuck E Cheese, and watched the Phils beat the Rockies. Today we've got breakfast, church, Char's family egg hunt, The Masters and then my sister's for Easter dinner over in Delco. From everyone here at Another Delco Guy, we wish you and your families a wonderful Easter. Last night was one of the most amazing nights of my life, as I sat next to Emma and heard her read pages to me from her new book, Hop on Pop. It arrived in the mail from Grandma yesterday and Emma was ready for it! I really recommend this book for young readers, it starts with easier groups of words and works up the ladder as the book goes along. Emma has always been a smart little one, but it's generally been in the category of silently watching everything and making incisive comments later. Char works at a school district and has been getting tips on how to help Emma along on this project. Recently, Emma has been part of Kindercare's Pre-K program which has a group of ten sight words a week for the kids to work with. 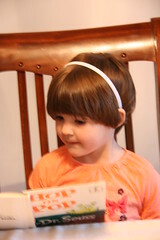 So when the book came, she combined her sight words with her love for Dr. Seuss and off she went! It's Friday and it's the first day of my spring vac(stay)ation, so we've got a vacation-themed Fantastic Four. What four things would you do for a non-travel vacation? What would you do with a week off and nowhere to go? Things start early here at DUG, so I am glad that UNC put the game away early last night so I could get to bed early. It's clear and cold here just outside our nation's capital, but I will be inside the gigantic Gaylord National Harbor all day. It's a beautiful new hotel and convention center that seems to dwarf even a large conference. I have finally arrived at The Gaylord National Harbor and there is not much of a view from my brand new room. I am headed down to the sports bar to watch the game. Have a great night and go Heels! As anyone who doesn't live under a rock knows, tonight the Phillies will begin the defense of their World Series title against the Atlanta Braves down at Citizens Bank Park. This will be my fourth consecutive home opener and I have yet to see a win, so I am hopeful that the karma is flowing in our direction after the Pat Burrell love fest left town yesterday. In other baseball news, my son John won the TAA Baseball Home Run Derby yesterday, hitting a few rockets out to the 87 foot mark. If that doesn't sound far, well then you have not actually tried to play baseball in a sandstorm before. Emma also participated in Opening Day, mainly by looking cute in her Royals uniform. Well, I am going to try to arrange travel and tailgate plans with 10 people who are planning-challenged. Your eyes are not deceiving you and this is an actual post on my blog! And no it has nothing to do with April Fool's Day. I will admit to neglecting things here a bit lately. Between coaching two baseball teams and running John to CCD down on Long Beach Island twice a week, there has not been a ton of time to do much of anything that is not directly related to the kids. I even took last Friday off to take care of a few matters of personal business like getting a haircut and having the car serviced. Still, after a frantic weekend of driving hither and yon I staggered into Monday feeling like I had not had a weekend at all, let alone a long weekend! I've also got a new writing project for work, nothing much, but still it takes away from the creative time at the keyboard. As part of an attempt to help demystify financail aid for families looking at higher education options, I've launched a blog at work. It's not much to look at yet, but we're adding more stuff all the time. 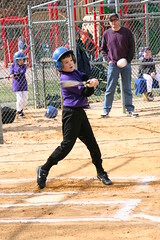 This weekend marks John and Emma's Opening Day of baseball on Saturday and the Phillies opener on Sunday. I'll be at both and there will be plenty of photos! Monday night after John's game, I have to head south to the new Gaylord National Harbor for a higher ed software conference. I am a bit bummed that it is not in DC itself this year but rather in some planned community/conference destination that was recently constructed southeast of DC. In the past versions of this conference, I have enjoyed wandering DC on the free afternoons and seeing the cherry blossoms and nearly being arrested. I guess I will have to check out the pool instead.